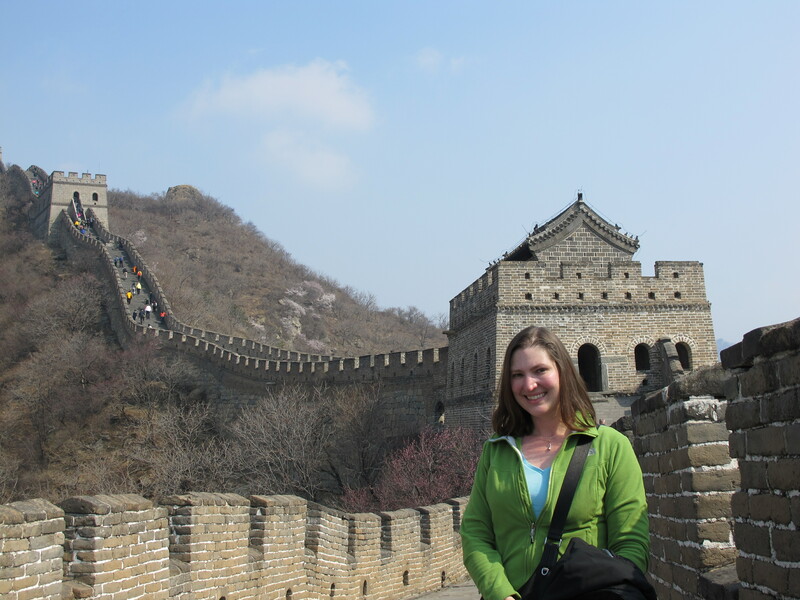 Now this is a little embarrassing, but before I knew I was coming to China and started paying attention to things, I had no idea that the Great Wall of China was actually more than one wall, in more than one spot, and built in more than one period. I imagined just one great Wall, winding its way across the northern reaches of China, uniform in its architectural glory. If you look at this map of the Great Wall(s) on Wikipedia, you can see what looks like a tangle of colored threads scattered across a fairly good chunk of China, with bits in what are today Mongolia and Russia. 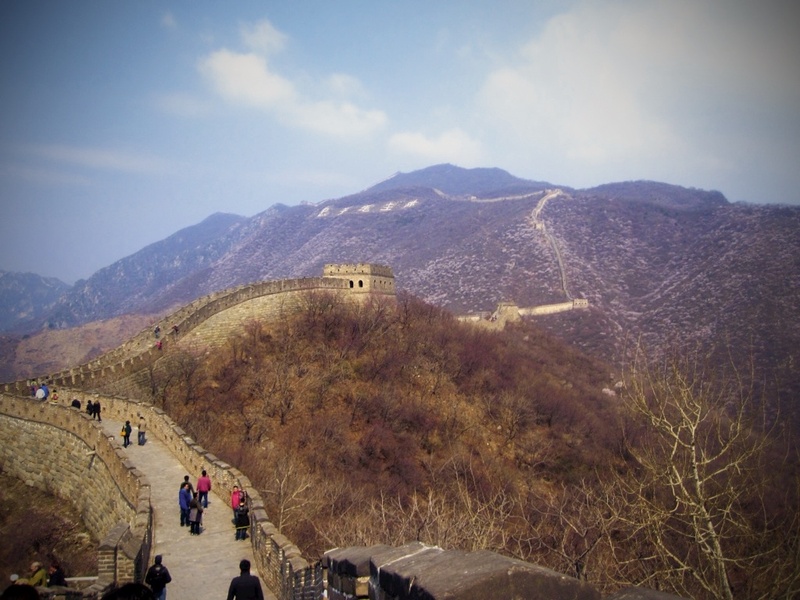 Parts of the wall were constructed as far back as 445 BC (BC! ), with more modern construction having taken place as recently at the 17th century. While there are long stretches of the continuous wall from my imagination, there are also many short, detached walls, new walls that bisect old walls, and parallel walls creating long corridors of enclosed area. And of course, with all those different walls, built in all those different eras, there is no single architectural style that describes the wall. They’re not even all built of stone. Probably I shouldn’t be surprised that the whole “visible from the moon” thing is a myth. 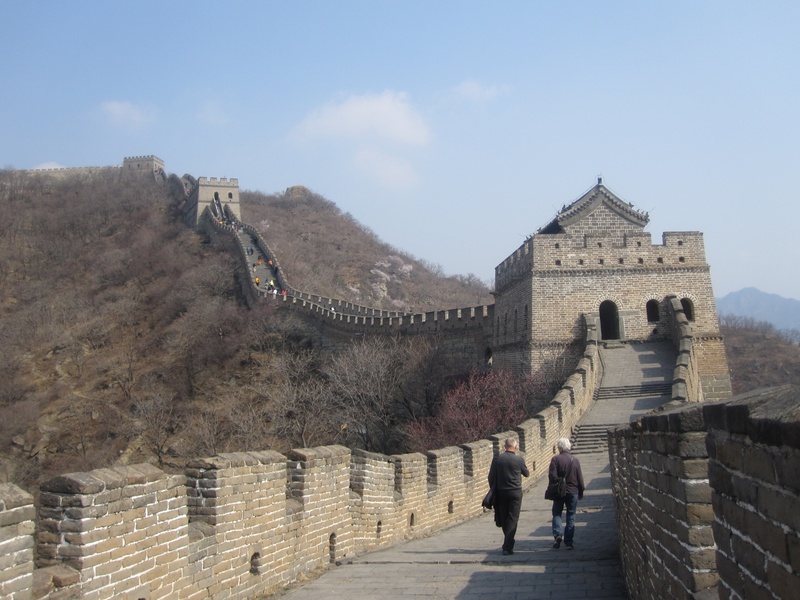 So when I got to Beijing, having not done my usual due-diligence and having not glanced at a single guide book, I had no answer when my hosts asked me which of the many Great Walls I wanted to see. 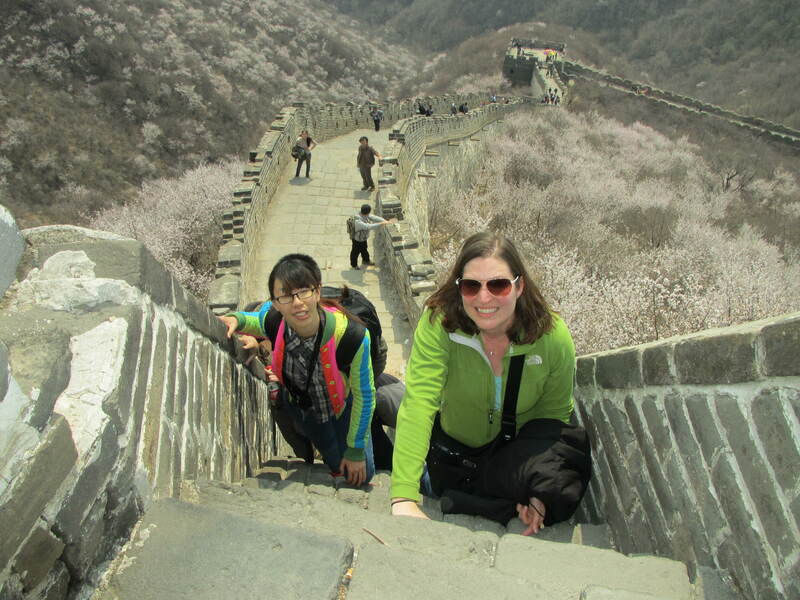 However, another friend suggested the Mutianyu wall, and that is what we decided to visit. 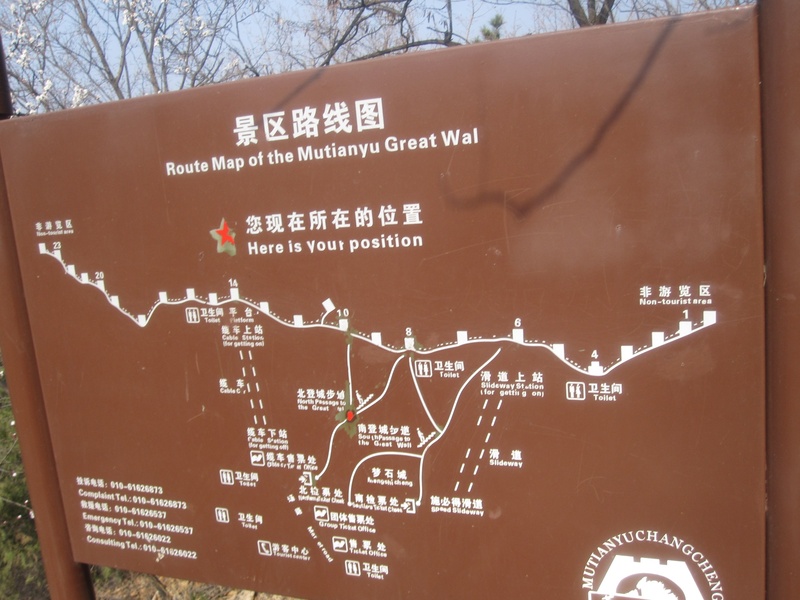 Mutianyu is a section of the wall located about 70 Kilometers outside Beijing. Built primarily of granite, the wall was begun in the Northern Qi Dynasty (550-577) and restored in the early Ming Dynasty (1368–1644). Mutianyu is an an extremely scenic, mountainous region, giving the wall a lovely and dramatic backdrop. Also, a lot of stairs. But more on that in a bit. The same friend that suggested the Mutianyu wall also said that the best way to get there was in a hired car. I did look into joining a bus tour, but the tour wasn’t guaranteed and only allowed for limited time (3 hours) to explore the wall. So for just 700 RMB, I hired a car and driver for the day. The driver met us at the hotel at 7:00, and we were at the wall before 9:00, despite taking the back roads and scenic route (in order to avoid the tolls, I learned). We were early birds on the wall: not only where there plenty of open parking spots in the lot nearest the entrance, but even the venders selling goods to the tourists were not all set up yet; most were only just arriving and beginning to lay out their wares. We quickly bought our tickets and headed up to the wall. This is a map that was posted about half-way up the stairs to the wall. 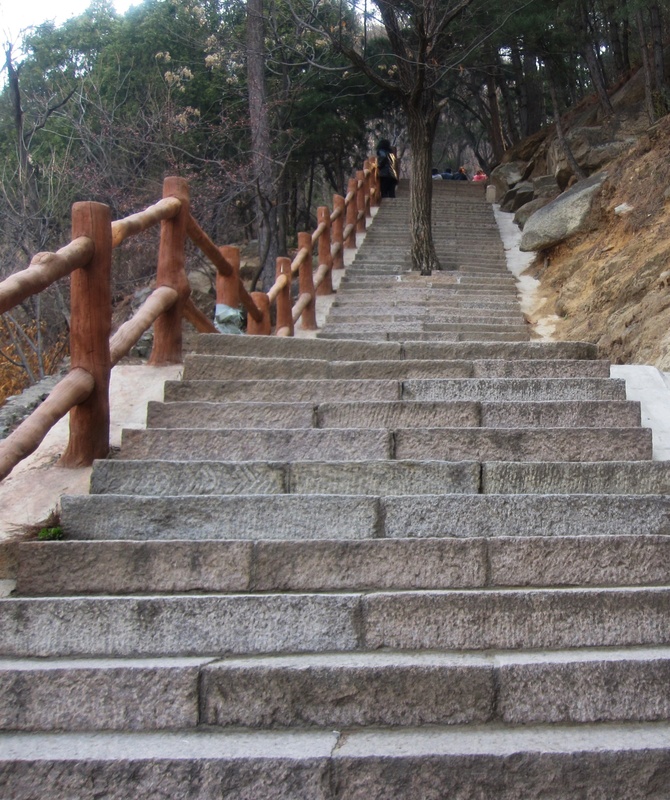 There are a LOT of stairs at Mutianyu. There are stairs to get you to the base of the wall (a LOT of stairs), and stairs you climb once you’re on the wall. You can optionally buy a ticket at the entrance to ride up to the wall in a gondola or chair lift, saving you at least some stairs. A few of the nice, uniform stairs that must be climbed before you reach the wall. Unless you’re smart and take the gondola. It was really quite exciting when we finally reached the wall. There it was: the Great Wall of China! The end of the stairs! Yay! Of course, I’m being a little facetious. 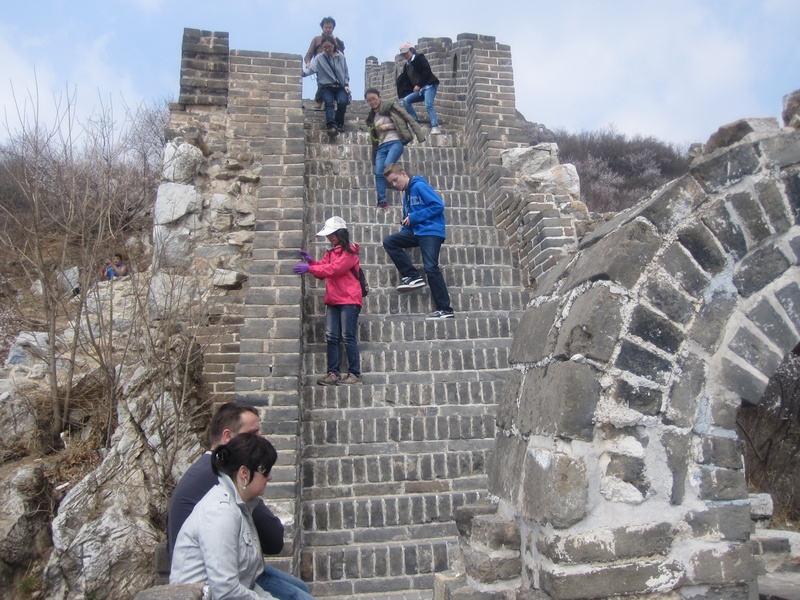 It wasn’t exciting to be on the Great Wall just because of the (presumed) end of the stairs; it was also awe-inspiring to be in a place so frequently dreamed of, so old and historic, so famous. And it really is a beautiful place: rugged mountains, dotted with blossom-covered trees, the Wall climbing up and down their slopes, watch towers visible on their peaks. It was a beautiful view, in a very special place. And one big benefit of getting there early (even with my slow ascent to the Wall itself) was that the top of the wall was not yet terribly crowded, and I even managed to get a few well-timed pictures with very few people in them. 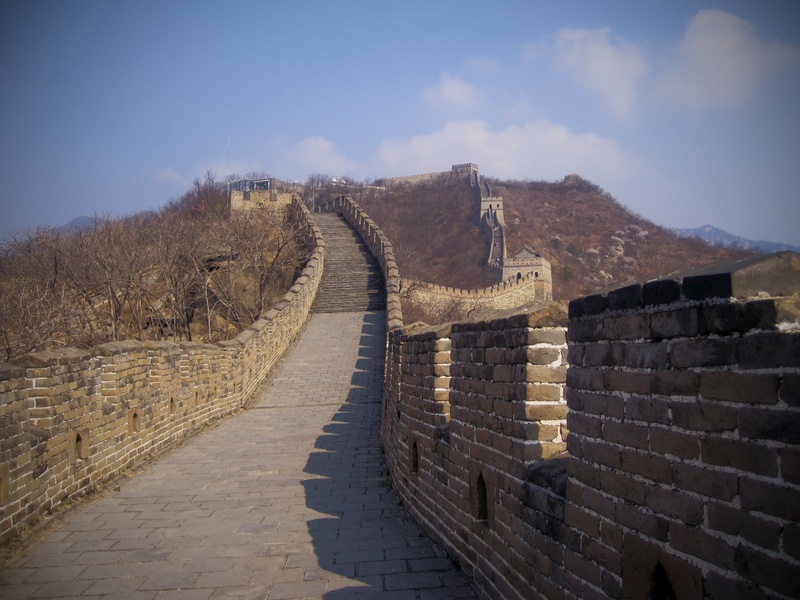 The Mutianyu stretch of of wall is approximately 1.5 miles long. We walked a little more than half that distance: From where we reached the Wall at tower 8, to a little past tower 20. See that tower at the tippy-top? (The one above the writing on the mountain that reads “Be Loyal to Chairman Mao”?) We walked nearly to that tower. Despite my (totally stupid) assumptions, the top of the Wall is not flat. It’s not a smooth stretch of walkway. Instead, it’s a mass of steps. Not the nice, uniform steps of the climb up to the wall, mind you. No. The steps on the top of the wall vary in both width and height. Some of the shallower steps are just that special width that takes about a step and a half to cross, so you always end up stepping up or down with the same leg. (Until you realize that one leg is getting a bigger workout than the other, start to worry that you’ll turn lopsided, and hurriedly add an extra-short step into the mix so you can switch legs and give your other side a bit of a workout.) But my real worry was the steep steps, which were almost universally narrow. Going up a passage of steep steps. This felt more like climbing a ladder than a staircase. Going up was “fun”, but honestly I was more afraid of going back down again. The steps were pretty narrow, meaning that my extra-long feet didn’t fit. Coming down, I had to stand sideways, hold on to the upper stairs as much as possible, and go very slowly. And lest you think I’m the only one, even those folks with smaller feet were descending sideways, and slowly. As the day got later, more and more people were on the Wall. (I think they took the gondola, smart people that they were.) But it never felt completely packed, which was very nice. And after a particularly steep stretch–I think it was Tower 19–it seemed that most of the tourists decided to call it a day and turn back. When we climbed the next stretch, we had both magnificent views and a bit of comparative solitude. After that, we turned around. And climbed down all those stairs we’d climbed back up. Four days later, my calves are still a little sore. But at least I’m not limping. Me on the Great Wall. How cool is that?